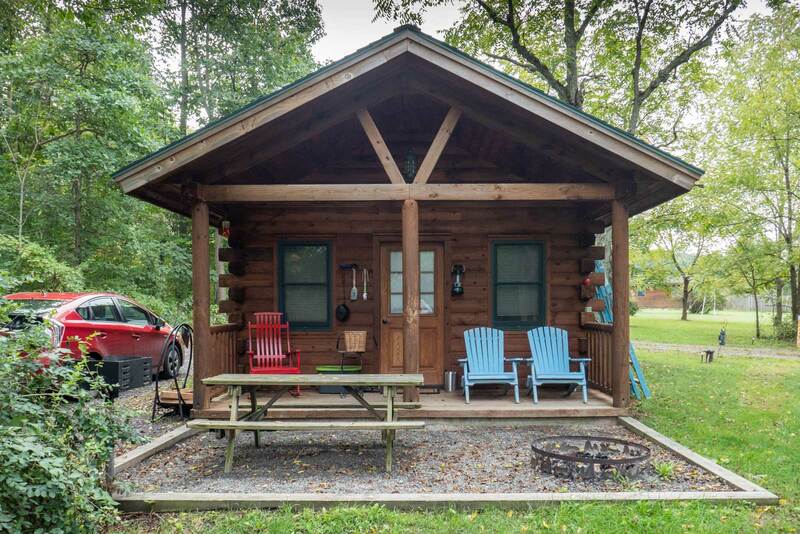 The Finger Lakes Mill Creek Cabins are set on more than 40 acres at the north end of the serene Finger Lakes National Forest. The property has three different cabins, all with ample parking as well as a large, shared recreation area. The cabins were built in 2006 and the property has been under new ownership since 2018. What makes the cabins so unique is the way they offer rustic isolation with all the conveniences of modern living. For example, cell phone reception is good enough to make emergency phone calls and there’s free wifi throughout the property. Each cabin includes a flat-screen TV and DVD player. The cabins are all stocked with water, wine and some basic cooking supplies (including utensils). Breakfast from Tastes of Wine Country Cafe is served every morning in the basket outside your door. You can do your own cooking, as each cabin has a stove-top oven, microwave, and coffee machine. Towels, soap, and shampoo are all provided as well. There’s a house phone inside each cabin with the phone number of a handyman who lives nearby. Lodi is conveniently located between the two largest of the finger lakes. Seneca Lake is to the west and Cayuga to the east. The nearest winery is roughly five miles west of the cabins, along Route 414. There are at least a dozen wineries between Lodi and Watkins Glen, which is the nearest town. The area is very rural and you will need your own transportation. Unless you are driving an SUV, you should stick to the main roads. Do not try to drive your Prius on dirt roads, no matter what your GPS says. You can access Parmenter Road from Route 137, which intersects with 414, which runs east of Seneca Lake and goes all the way to Corning. This post was sponsored by the Finger Lakes Mill Creek Cabins. For more information about the property, click here. All pictures were shot with a Panasonic Lumix ZS100 4K Point and Shoot Camera. Just leave me there with my family and enough yarn to crochet me a blanket and I am sold! Looks so nice! I love to be where it is peaceful like this. The cabins sound amazing and like a perfect getaway to relax. Definitely my kind of place. Now this is my kind of vacation. I have dreamed of owning my own log cabin in the woods, but I guess I have given up that dream of owning one. Staying in one is the next best option. I will bookmark this page and show it to my husband later. Hopefully we can plan a family trip there when the weather is more inviting. wow this is such a great place to stay! We’re planning a trip to Niagara Falls and I feel like it’d be such a great place to stay! I been to the Finger Lakes but not this part. I have to tell my mom about this because she would LOVE this! Looks like this was a great spot for you, Brian! Thanks for sharing about the adventure buddy!